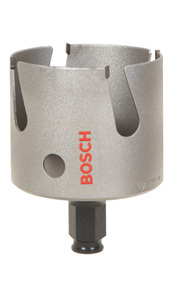 Tool Blog News Bosch has carbide hole saws. If you remember a few posts back, the post titled New hole saws from Milwaukee. I criticized Milwaukee for making these new hole saws, but not using carbide for the teeth. Well I did not know at the time that Bosch already has carbide teeth hole saws. If I had known this, I probably would have been even more baffled as to why Milwaukee choose to dismiss the feature. I guess I shouldn't be too hard on Milwaukee, the price of the Bosch is more then double the price of the Milwaukee. Amazons current price for a Bosch 3 inch Carbide tooth hole saw is $86.94 while the Milwaukee is $33.57. Just for price reference a standard 3 inch hole saw is around $10. So I guess Milwaukee wanted a better rough cut hole saw that wouldn't cost an arm and a leg. I would like to see some side by side comparisons to see how they both stack up.